7 No 10 : Number 10! With so many position numbers in soccer and with so much innovation to have taken place in the game in the last 20 years adding more all the time, it can be difficult to keep track of all the different position numbers on a soccer team. Largely self-explanatory and this is comfortably the most unique position on a soccer field as it is the only one in which you are allowed to use your hands. A traditional view of soccer would be that goalkeeper has one job and one job only which is to keep the ball out of the net by any means necessary. Whilst this is largely true I think it is fair to say that the job of the goalkeeper has been embellished in recent years and now encompasses a wide range of different aspects. With so many more teams setup for counter attacking soccer, as well as being the last line of defense the goalkeeper also becomes the first line of attack because very often when they have the ball in their hands they will look forward and seek to start off quick counter attacks. Since the laws of soccer were changed about 20 years ago to stop a team from being able to pass the ball back to their goalkeeper for them to pick up with their hands, goalkeeper's have had to become much more adept at playing with their feet and have to kick accurately using both of their feet to deliver the ball up the pitch in the right way. In modern day soccer with a number of teams playing high offensive lines and surrendering space behind them it has become the role of the goalkeeper to defend that space and not just stand on their line and save shots but to be on the front foot to come out and meet attacks even if this involves playing outside of the penalty box at times. The role of full back is another to have evolved quite dramatically in the last 20 years of soccer. It used to be the case that fullbacks were astute and tough defenders who chose their moments to tackle and then tackled hard! Nowadays though full backs are required to run a huge amount of distance at sustained speed up and down the pitch. They are needed to make contributions in both penalty boxes meaning they need to cover the full length of the pitch as this often means running back to cover counter attacks or indeed counter attacking themselves at high speed. Very often these are the tallest players on the team reflecting the fact they are required to make a lot of important headers that prevent goals within their own penalty area and these are added to with blocks, tackles and clearances. There is a school of thought that high class defending is becoming a lost art in the game as more and more teams turn towards good footballers rather than good defenders who have nice touches and can build up play with good passing but don't necessarily possess the out and out defensive skills needed to keep the ball out of the net enough. Central defenders are often the most physical players on the team as they require strength to hold off attackers. There has been a shift towards defenders who have more pace to be able to cope with the demands of modern soccer however many of the great center-halves through history were not blessed with good pace but were able to read the game and make valuable tackles and interceptions through knowing where to be at any time. A sweeper is a special type of defender who plugs gaps defensively in order to stop the opposition from scoring. Very often they do not have any physical responsibility or defend 1 vs 1 but will support situations as they see fit. They provide added support to the defensive unit but are often spare players at the back who can be used to build up attacking play. This position was used for decades to effect by the Italians who would play man markers as their center halves against the opposition attackers and a spare man as a sweeper who would read the game and support as needed. The traditional role of midfield players is to support the area of the pitch where the ball is at any given time. They have responsibilities both defensively, building up play and also in attack. Some of the most respected players through history have been midfield players and the very best ones are able to stop goals, make goals and score goals. Ironically enough, as many other areas on the pitch have asked for more running from the people that play there, it could be argued that the traditional box-to-box role of midfielders is not quite the same as it was as different tactical shapes have meant that midfielders often operate in smaller or tighter zones. For instance, a central defensive midfield player may only operate in a small area in front of the central defenders and screen the ball from going into the feet of the opposing center-forward. Very often they will operate in a small zone in front of their own defense and their job is to break up opposing attacks and win the ball back for their own team. Often these players will not have the most progressive range of passing but will look to keep the ball by making safe and secure passes to teammates when they have won possession. It is the popularity of this type of midfield player that has enabled fullbacks to be much more forward thinking. The traditional winger was a role for speedy and skillful players who were often short in stature but had really quick feet and could run with the ball. They were ball carriers and were able to gain yardage for their team up the pitch whilst also providing the dangerous balls into the penalty area for their strikers to score from. A typical winger would often create chances for their strikers by beating full backs with pace and trickery and delivering dangerous crosses into the penalty area for their own attackers. No 10 : Number 10! A position named after the shirt number that usually plays there! 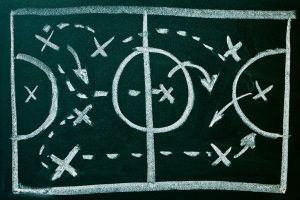 A number 10 in football is another relatively unique position and although it has only really been known as the ‘number 10’ position in the last couple of decades, a deep lying center-forward, is not necessarily a new innovation. The number 10 role usually sees a specific player occupying the space between their team’s midfield players and their forwards. They often have a free role in this area and teams will try to get their number 10 in possession of the ball so that they can either turn and run at the opposition defense or look to play forward passes to the strikers that are dangerous. There have been several high-class number 10 players down the years who have excelled in this role and very often teams will place their most skillful or best player in this position. Very often this is the position that most young soccer players grow up wanting to play above all others. The primary responsibility and role of the center forward is to score goals which makes it a glamour position and the one that most people would choose to excel in. There are many different types of center forward reflecting the fact that it is possible to score goals in many ways. Some center forwards are big and strong and lethal in the air at heading. Others are sometimes shorter and faster and threaten defenders by being able to run into the space behind them using electric pace. Some possess very few physical attributes but are natural goal scorers in that they can anticipate with great accuracy where the ball will drop at any given time in play and they can react first to this giving them the time and space they need to take shots and score goals. Sometimes professional soccer teams play with only one central striker although several teams play with two central strikers who can operate as a pair and work together to create chances and score goals. There have been numerous famous center forwards in soccer history with some remarkable goalscoring achievements. These are just some of the most popular soccer player position numbers on the soccer field although with more innovation taking place new ones are being invented all the time. Check out the video below for a great compilation showing names of some of the greats who have played in these positions over the years.